RAFT developed the urban design for transforming this dangerous arterial into a safe and healthy infrastructural landscape. Two of the roadway’s twelve moving lanes will become pedestrian malls defined by large canopy trees and broad decked walkways elevated above continuous green infrastructure. Canopy trees adapted to inundation with stormwater will divide the wide road into smaller spaces with shorter crossings. Continuous soil zones with access to air and water will support robust trees. 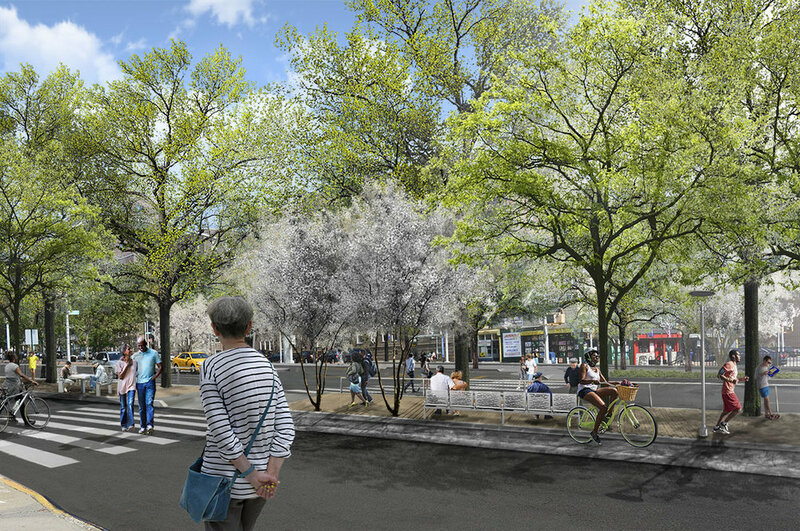 The project will repair a gash through the urban forest of Queens with 4500 new trees. The redesign of Queens Boulevard is a top priority in Mayor DeBlasio's Vision Zero Plan, which seeks to eliminate deaths and serious injuries from traffic conflicts. The redesigned street will become a connector rather than divider between neighborhoods. Widened medians will improve social and ecological health along the 5-mile corridor.